The next-generation Global Positioning System, known as GPS 3. The GPS 3 spacecraft constellation will improve position, navigation and timing services and provide advanced anti-jam capabilities. LITTLETON, Colo. — A new factory built to crank out the next generation of advanced Global Positioning System satellites will draw upon some Hollywood magic: 3D glasses and virtual reality. Aerospace firm Lockheed Martin opened its new GPS satellite processing facility here last month. Sporting 50,000 square feet (4,645 square meters) of spacecraft assembly and test area, the area includes a high bay clean room and dedicated test chambers. The U.S. Air Force has laid out plans to order as many as 32 GPS 3 series satellites. The Air Force Space Command's 2nd Space Operations Squadron, based at neighboring Schriever Air Force Base in Colorado Springs, manages and operates the GPS satellite constellation for both civil and military users. The new Lockheed Martin facility is expected to deliver four spacecraft per year and has capacity for the construction of as many as seven space vehicles at one time, said Mark Valerio, Lockheed Martin's vice president and general manager for surveillance and navigation systems. "Like in aircraft and automobile production, each GPS 3 satellite will move through sequential workstations for various assembly and integration operations, culminating with environmental test procedures," Valerio noted in opening day remarks. The satellites will be designed to have a 15-year life, three to seven years more than current spacecraft. In fact, more than half the satellites currently in orbit are past their mission design lifetimes. The first GPS 3 satellites are scheduled to be available for launch in 2014.Already sitting on the factory floor is a GPS 3 "Non-Flight Satellite Testbed" – a full-size, flight-equivalent prototype of a GPS 3 satellite. It is being used to identify and solve development issues before the first space vehicle is assembled and tested. "We are using innovative virtual reality technology and model-based simulation that is reducing risk upfront and contributing to savings in both time and cost," said Michael Friedman, a Lockheed spokesman for the GPS 3 program. A GPS 3 Non-Flight Satellite Testbed – a full-size, flight-equivalent prototype of a GPS 3 satellite – is being used to identify and solve development issues prior to integration and test of the first spacecraft. The lab can validate, test and understand products and processes virtually, before the products are created physically. "With this virtual approach, any issues are surfaced early in development, allowing them to be solved quickly and with little to no impact to the program, " Friedman told SPACE.com. "In effect, we have already built and proven the GPS 3 satellite virtually." According to Jeff Smith, director of special projects for the Lockheed Martin Space Systems Co., while similar technology is being used in the movie industry to create fictitious worlds, "the CHIL is real" and makes use of motion tracking and virtual reality technology. By exploiting the CHIL, the company hopes to solve problems quickly. Hardware designs and manufacturing processes can be fine-tuned before production or development begins. Doing so will allow engineers to identify risks and increase efficiencies early in program development – when the cost, risk and time associated with making modifications are low, Smith added. For the GPS 3 program, a Collaborative Human Immersive Laboratory is being used to validate, test and understand products and processes virtually, before creating them physically. In 2008 Lockheed Martin was awarded a $1.5 billion contract for the design, development and production of the GPS 3 Non-Flight Satellite Testbed and the first two GPS 3 satellites, with priced options for up to 10 additional satellites. Early this year the Air Force exercised options worth $238 million for production of the next two GPS 3 satellites, numbers 3 and 4. Ultimately the Air Force plans to purchase up to 32 of the navigation satellites. There will be several challenges in the years ahead to modernizing GPS satellites, said Joe Trench, Lockheed Martin’s vice president of navigation systems. First, so many of the current satellites are past their mission design lifetimes. Second, GPS demand is increasing, with users asking for more accuracy. That means the need for more-powerful spacecraft, more availability and better Earth coverage, Trench said. Trench also underscored one worrisome trend. "Adversaries are working aggressively to mitigate the U.S. GPS combat advantage," Trench said. 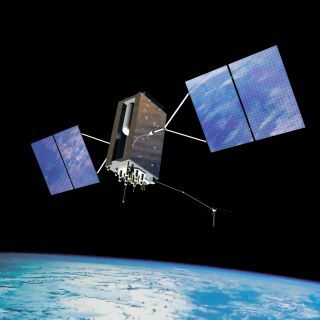 "Advances in jamming, spoofing and cyberattack make the current GPS system increasingly vulnerable. Additionally, warfighters need more accuracy and better Earth coverage to operate with precision when and where it matters most." A look at the 50,000 square feet of spacecraft assembly and test area, which includes a clean room high bay and dedicated test chambers for the GPS 3 program. An improved information-assurance architecture with GPS 3 also will deliver better cyberdefenses and the ability to detect, mitigate and respond to cyberattacks, Trench noted. Additionally, GPS 3 will pump out signals that are up to four times more accurate than those from the current spacecraft. With increased Earth coverage, the promise of GPS 3 is to improve access to GPS data from around the world, including from canyons, mountains and dense urban environments, Trench said. Highlighted during opening day presentations was that GPS 3 will be the first to include the new L1C signal designed to be interoperable with global navigation satellite systems from other nations. During the GPS 3 ceremonies, Valerio jumped back in time to offer some perspective. Navigation from space was first conceived in 1957, when two scientists at the Johns Hopkins University Applied Physics Lab were listening to signals from Russia’s Sputnik 1 satellite. APL's George Weiffenbach and William Guier were able to determine Sputnik's orbit by analyzing the Doppler shift of its radio signals. After this, the two had a "Eureka" moment, Valerio pointed out. If a satellite’s position was known and predictable, then the Doppler shift could be used to locate a receiver on Earth. In other words, one could navigate by satellite. "At the same time, while developing the submarine-launched Polaris missile, the U.S. Navy identified a need to better track the precise location of their submarines," Valerio added. This need spawned initial federal funding for the first space-based navigation programs … and helped to propel GPS to become today’s global utility, he concluded.